The rough and tumble of campsite life tests any product and we have carefully chosen materials to match our table designs to ensure durability while maintaining chic good looks. Table tops have come under special scrutiny and we have chosen quality materials to fulfil needs – and these are epitomised by our Weatherproof tables. We continue with the melamine laminate, Sevelit®, to provide a quality finish to Finley . The hardy Outwell Finley M folding table can withstand all the rigours of outdoor living. Seating up to six people, there’s room to dine, cook and play. 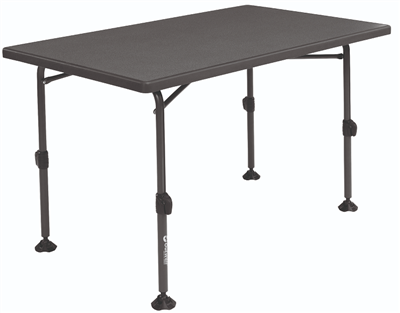 The tough tabletop is heat, UV, water and scratch resistant, and there are adjustable telescopic legs and oversized feet for greater stability. The legs fold under when not in use and handles make it easy to move around.